LA Robotics Club is having their second Arduino class. This time it's a little different, everyone will be building an ARD-Bot. This is a little two wheeled disk with a dragging caster in the back. They parts kit is about $50 from http://www.pololu.com/ but the club got a deal for it's members and the cost to members is only $35. 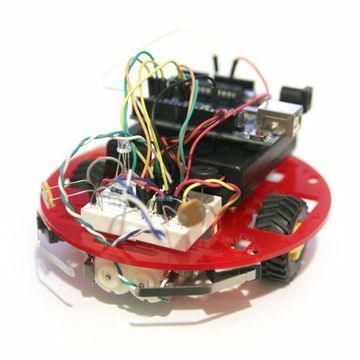 The Robot is an acrylic chassis and comes with dual motor gearboxes. It also has a dual H-Bridge motor controller, two photoresistors, battery packs and all the other little goodies that make it work. Two front bumpers switched are used to sense obstacles in the bots path. This guy will include an RGB led and a piezo speaker for feedback. The class will include building the gearbox, assembling everything and programming several test sketches. If we get enough of these little guys working, there may be an Easter Egg Hunt at the end. This is where the lights will be lowered and illuminated Easter Eggs will be found by the bots sensors.